I might add that almost all of the Buddhist literature written in Sri Lanka in Sinhala were not primarily philosophical but "devotional", and dealing with the virtues of the Buddha. It can also be shown that these devotional and miraculous elements existed in the oldest levels of the canon, but they existed very clearly in the late canonical collection the Khuddalca Nikaya, or the "minor collection". It was called the "minor collection" because it did not deal with the abstract doctrine. However no Buddhist monk or scholar prior to modern times ever believed that these texts of the Khuddalca Nikaya were false or unimportant. To put it differently I want to make the unpopular argument that Buddhism is not a philosophy but a religion - that is, a system of cosmological and philosophical thought that coexists with a set of devotional beliefs and practices. Olcott as well as many Buddhists nowadays assume that Buddhism is a philosophy whereas other religions are not. This is based on pure ignorance because all of the monotheisms - Judaism, Christianity and Islam -developed extraordinary complex philosophies and some of these have affected practically all the secular philosophies of the modem West, even radical philosophies like Marxism and Freudianism. Once' the religion was defined as an atheistic or scientific philosophy there was little room for recognising that Buddhism, for ordinary people, entailed a devotional cult of worship of the Buddha and insofar as this was the case it was a faith. Moreover this Buddhist faith or set of devotional practices was articulated to a variety of institutional forms that had developed in the course of its long history. 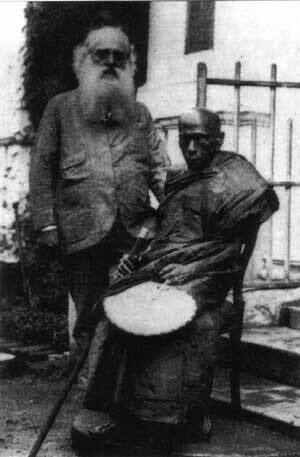 Olcott was sometimes ignorant of, sometimes unsympathetic to, this larger tradition of Buddhism. Many modem Buddhists who have inherited Olcott's message have to face certain painful dilemmas in defining Buddhism in this way. Let me highlight some of the areas where Olcott's rationalist religion showed some severe limitations. Neither Olcott nor Dharmapala has little empathy or understanding of village rituals for gods and demonic beings. Note the pejorative term used by Olcott "devil dancing". This term employed by Western scholars, antiquarians and missionaries of the 19th century is explicitly derogatory and it is pathetic to see Western educated Sinhala-Buddhists use this term to characterize the astonishing variety of complex rituals practised in village society for a variety of important occasions. In fact, contrary to Olcott and Dharmapala, the so-called "devil dancing" is essentially Buddhist in spirit. Their origins might have been non-Buddhist but over a long historical period they have been ethicized (i.e. rendered ethically salient) and given Buddhist value and significance. For example, the bali rituals propitiate planetary deities but as santi karma, acts of blessing, they deal with the virtues of the Buddha and recite events from his life including his miraculous birth, the four signs, his dispassion with lay life and the final act of renunciation. Moreover contrary to Olcott, one can argue that the incorporation of gods and demons into the specific Buddhist scheme of things was already effected in the main body of the doctrinal tradition, that is, the suttas, or discourses of the Buddha. This was done through the karma theory. The Buddha himself on numerous occasions discusses how a person is reborn as a god demon or ghost preta owing to the working out of his karma. As the Buddhist scholar Marasinghe says, the theory of karma and rebirth then is a kind of mechanism that continually churns out gods and demons! Their karma-bound nature means that they are part of an ethically bound cosmic order, or samsara. The preceding argument indicates that the relation between doctrinal tradition and the popular religious beliefs and practices of Sinliala villagers was not all that discontinuous. In general Western scholars of Buddhism and educated Sri Lankans seem to agree on one thing, namely, that the ordinary village propitiation of Hindu gods and demons in communal rituals was non-Buddhist or "animistic." Quite the contrary: village ritual dramas, on one level, are kinds of morality plays, with demons representing Buddhist notions of hate, illusion, desire, and attachment. The whole dramatic interplay between gods, demons, and the Buddha enacted in these rituals concretizes the abstract ethical value of the doctrinal religion. Olcott was no doubt aware that at the time he wrote the Catechism, ordinary Buddhists were engaged in the worship of the Buddha in temples. These devotional practices in the temple are intrinsic to the Buddhist faith and require no emphasis to a Sri Lankan audience. But what is less known, at least today, is that the worship of the Buddha coexisted with a knowledge of his life and the legends of his past births and a variety of stories of heavens and hells and their denizens; and this knowledge was inoculated in children in very early childhood through parental story telling. Social scientists are becoming increasingly aware of the power of stories in the moulding of the conscience and the perpetuation of religious knowledge and memory. Olcott unfortunately had little place for this body of knowledge in his conception of philosophical Buddhism. Many of these popular stories and texts were canonical but for the most part they were found in the Khuddaka Nikaya, the very text that Indologists and Buddhist scholars had treated as extrinsic to the central tenets of Buddhist thought. These texts of the Khuddaka Nikaya intersect with the lay tradition. Some of these are well known to us as pirit (paritta) texts, the jataka or birth stories of the Buddha, the Dhammapada and a host of texts such as the Peta vattu and Vimana vattu that deal with vivid descriptions of heavens and hells and rebirth into various planes of existence. To say with Dharmapala and Olcott that Buddhism had no notions of heaven and hell is therefore plain nonsense. Rhys-Davids also points out that the pirit texts were influenced by the raksa mantras of the popular tradition; these pirit texts in turn began to influence the popular traditions, so that our bali and tovil ceremonies contain Sinhala renderings of pirit texts. In fact, a large number of texts of the Khuddaka Nikaya exist in both Pali and Sinhala renditions; they are both in the canon and outside of it. The Khuddaka Nikaya also influenced a huge body of vernacular literature that I have labeled "intermediate texts" - "intermediate" because they neither belong to the Pali canon nor the folk literature of villagers. By "intermediate texts" I refer to such compendia like the Saddharmaratnavaliya and Saddharmalankaraya (and a so texts that are no longer extant like the Kesadhatuvamsa). As most of you know our temple frescoes deal with the stories from these intermediate texts with brief captions in Sinhala to give the viewer's memory a jolt in order to help him recollect the full story. These stories are almost exclusively from the jatakas and the Buddha legend. They are almost entirely non-philosophical and do not concern themselves with abstract issues of doctrine and psychology. They were also widely known and diffused among ordinary people through a wide variety of sources. Monks used these stories in their sermons to illustrate ethical issues and also to render to the laity some of the doctrinal ideas important to Buddhism such as the Four Noble Truths, and central concepts like karma, anicca (impermanence) anatta (no-soul) and samsara. Buddhist ideas, selectively filtered, entered the popular consciousness through the stories of these intermediate texts. It should be remembered that the main body of the Pali Canon was never translated into indigenous languages until very recent times. These stories were the lifeblood of popular Buddhism in pre-Colonial times. The Buddha is the hero of these stories. They deal with such themes as the self-sacrifice of the Buddha for the welfare of others, the problematic nature of good and evil, the self destructive nature of violence that can only beget more violence, the paramountcy of renunciation and the ethical dilemmas it entails. These stories permeated Buddhist cultural practices in a multitude of ways. Indologists and Buddhist scholars however tended to "ethnologize" these stories by viewing them as folk tales or popular superstitions. It is indeed the case that it is difficult for modern educated audiences to treat these stories as literally true. For example, students trained in modern biology or evolutionary theory may not be able to literally believe that the Buddha was born as a leader of a troop of monkeys and that he sacrificed his life for their welfare. But this problem pertaining to the truth value of stories is something that other religious traditions also had to face in modern times. For example, the modern Protestant theologian Bultmann introduced the key notion of demythologization to show that, while Christian stories and miracles might not be literally true, they can be viewed as parables with a profound symbolic truth value. I think it possible to demythologize Buddhist stories also in a manner that makes sense to children as well as adults in Buddhist nations. For example it is possible to treat the Buddha's births as a monkey or elephant or tiger or a deer as parables illustrating Buddhist notions of self-sacrifice and the profound Buddhist truth of the basic affinity between man and the rest of the sentient world. In-so-far as the animals is the Buddha himself these parables might help the reader or listener to identify with a being outside of the human community. Such a parabolic exposition fits with Buddhist cosmological conceptions that life and the world samsara - embrace every creature. These type of tales help break the barrier between self and other, such that empathetic communication is rendered possible - something desperately needed in the harsh times we live in. These stories also show a basic affinity with village "devil dancing" rituals. They too are replete with ogresses and demons. These terrifying beings are ultimately humans who have been reborn in that state though greed and hate, both forms of attachment (tanha) and they can also revert to human form and humane ethical living. The demon is both outside us as a living creature, and one of us as a samsaric being, and within us as an anthoropomorphisation of Buddhist ideas of attachment, greed and hate. In these texts there is not only a recognition of the futility of vengeance and retaliation, but there is no conception of irremediable evil. In fact in many of the Jataka tales ogresses and demons are eventually made to recognise the ethical viewpoint of Buddhism. Parallel with this is that the hero of these stories -the Buddha - never advocates any form of violence. It is impossible for the Buddha of these texts to say "Vengeance is mine". The foregoing discussion leads me to speculate in a tentative manner on a topic that is of central concern to any religion (though not to any philosophy). This is the formation of a Buddhist conscience that in turn entails the internalisation of the Buddha figure in the consciousness of Buddhists. We have noted that the stories of the popular tradition enters the consciousness of Buddhists through a variety of sources - childhood story telling by parents, in the sermons of monks, in the songs and dramas enacted in village rituals, in temple frescoes and so forth. The ideas contained in these tales then are internalized in the consciousness and conscience of Buddhists and they affect everyday living. The figure of the Buddha is internalized in the same manner and this internalization is facilitated by the devotional practices of worship in Buddhist temples. The worship of the Buddha in conjunction with the traditions of storytelling, facilitates an internalized image of this Being in the popular consciousness. Thus in essence the development of conscience in Buddhism is not different from Christianity or Islam except that the Buddhist socialisation of the conscience is much more difficult than that prevailing in the monotheistic religions.